Elul in Kelm was drenched with Mussar and Yiras Shamayim. 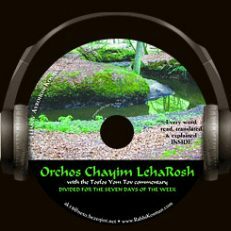 We can reexperience a bit of that unique atmosphere by continuing their special custom of learning every day of Elul from Orchos Chayim L`HaRosh. A mussar classic from the Rosh, famous commentator and Posek on the Talmud. This work contains “Mussar Bites”, and is divided into 7 parts, to enable completion on a weekly basis.